Home Pump Drives Challenges With Shaft Alignment In Chemical-Transfer Applications? Shaft misalignment can result in compromised pumping-system uptime, reliability and safety. Blackmer offers a solution with its new alignment-free GNX Series sliding vane pumps. It’s an unavoidable fact of pump operation: mating shafts require alignment. Perhaps it is a direct-coupled pump with alignment between the motor and pump. Or a reduced-speed pump with alignment between the gear motor and pump. 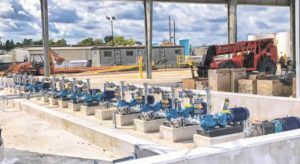 The nirvana for pump operators is a set-and-forget system that eliminates any chance of the shafts coming out of alignment, but the reality is that there are a wide variety of things – both operationally and in the way the pump is handled – that will cause pumps to fall out of alignment. The first is vibration, which occurs whenever a pump operates. A second major cause of misalignment is maintenance. When pump or system maintenance is required, the pump is often decoupled from the motor. If the reinstallation is done in haste, the pump will be out of alignment when recoupled. Search has been on for a technology that can be classed as “alignment free,” while still possessing the ability to deliver the high flow rates and transfer volumes that are the backbone of chemical fluid-transfer operations. In essence, what was needed was a design that eliminates the couplings between the gearbox and the pump and motor by structurally connecting them rigidly in alignment with a C-face (or similar) motor on both the high-speed (or motor) and low-speed (or pump) sides of the setup. 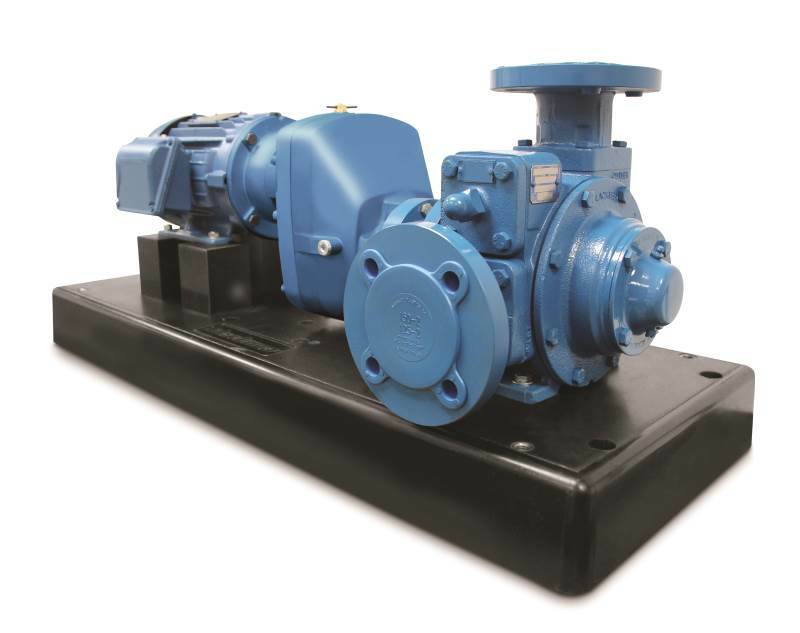 The permanently connected gearbox in the GNX Series sliding vane pump eliminates all couplings and allows all rotating components to be totally enclosed without the need of guards, which makes it the industry’s first truly alignment-free pump. Blackmer has found the solution with its new GNX Series sliding vane pump. 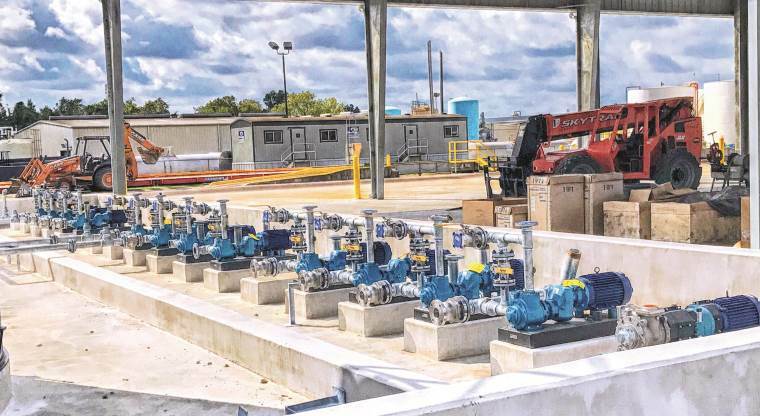 The GNX Series pumps are an enhancement of Blackmer’s GX Series models, which have been in service since 1959 and are cast-iron pumps with an internal gear reducer for use in the transfer of various chemicals. The GNX pumps use the proven features of the GX pumps and take them to the next level with the incorporation of a commercial-grade, single-stage gearbox. This innovative gearbox fits between the motor and pump and is held in place by a permanent dowelled connection that creates a structural link between the high-speed and low-speed sides of the system. This redesigned gearbox is constructed of rigid aluminum housings (for 2 to 2.5-inch pumps) and cast-iron housings (for 3 to 4-inch pumps) and has NEMA C-face or IEC D-flange motor-input connections. The gearbox output has a proprietary hollow shaft that is compatible with the pump’s keyed shaft. This capability results in the industry’s first alignment-free pump that can produce flow rates from 20 to 500 gpm (76 to 1,893 L/min). The alignment-free design is well suited for both fixed and portable applications with the gearbox possessing the ability to create turndown ratios ranging from 2:1 to 13:1, resulting in more precise flow rates. While many chemical fluid-transfer operations may take place in harsh environmental conditions, the pumps and systems used to facilitate product transfer are in actuality delicate ecosystems that must be kept in balance and operate in harmony.